Lowe syndrome, also called oculocerebrorenal syndrome (OCRS) and oculocerebrorenal syndrome of Lowe (OCRL), is an X-linked recessive metabolic disorder described by Lowe and coworkers in 1952. It is a multisystem disorder that primarily affects the eyes, nervous system, and kidneys. It is characterized by congenital cataracts, infantile glaucoma, neonatal or infantile hypotonia, intellectual impairment, and renal tubular dysfunction (Fanconi syndrome). Oculocerebrorenal syndrome is so named because of the prominent involvement of the 3 major organ systems; however, involvement of bone, gonads, muscle, skin, and connective tissue, as well as stereotypic behavior, also can occur. Additional manifestations include corneal keloids, growth retardation, areflexia, metabolic acidosis, proteinuria, aminoaciduria, and noninflammatory arthropathy. These patients often exhibit the characteristic facial appearance of frontal bossing, deep set eyes, and full cheeks, although the characteristic phenotype is often difficult to identify in neonates. Female carriers manifest characteristic lens opacities, but they typically have normal renal and neurologic function. See the image below. Classic lenticular opacities in a female carrier for Lowe syndrome. Note the punctate cortical opacities in radical wedges. Image courtesy of Otis Paul, MD. Ocular: The hallmark feature is congenital cataracts. Left untreated, the cataracts will cause nystagmus and eventual blindness. Glaucoma develops in 50-70% of patients, typically manifesting in the first year of life, but it may present at any age. 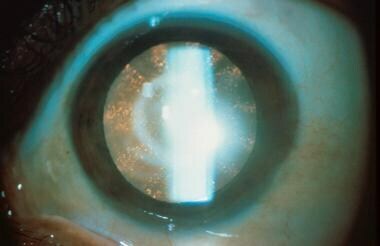 Patients also may develop corneal leukomas. Amblyopia may occur secondary to poor compliance with treatment and secondary strabismus. Corrected visual acuity is infrequently better than 20/70 despite optimal management. The visual impairment represents a combination of the morphologic changes in the eye, retinal dysfunction, and cortical functioning. Renal: If untreated, the proximal renal tubular acidosis leads to failure to thrive and metabolic collapse. By the second to third decade, gradual loss of creatinine clearance occurs, with progressive renal failure. Growth: At birth, these patients are within the normal growth curve but fall off in length, height, and weight in subsequent years. Neurological: Neonatal hypotonia may contribute to poor feeding and delayed motor development. Life expectancy: Patients with appropriate therapy may live to be 30-40 years of age, generally dying from renal failure, respiratory distress, status epilepticus, or infection. With improved medical treatment, infection as a cause for death has declined dramatically. The expected life span has not yet been defined. Lowe syndrome occurs almost exclusively in males. It is an X-linked recessive disorder. The female carrier state is identifiable by characteristic lenticular opacities. Lowe CU, Terrey M, MacLachlan EA. Organic-aciduria, decreased renal ammonia production, hydrophthalmos, and mental retardation. Am J Dis Child. 1952. 83:164-184. Loi M. Lowe syndrome. Orphanet J Rare Dis. 2006 May 18. 1:16. [Medline]. Luo N, Kumar A, Conwell M, Weinreb RN, Anderson R, Sun Y. Compensatory Role of Inositol 5-Phosphatase INPP5B to OCRL in Primary Cilia Formation in Oculocerebrorenal Syndrome of Lowe. PLoS One. 2013. 8(6):e66727. [Medline]. [Full Text]. Kim HK, Kim JH, Kim YM, Kim GH, Lee BH, Choi JH, et al. Lowe syndrome: a single center's experience in Korea. Korean J Pediatr. 2014 Mar. 57(3):140-8. [Medline]. [Full Text]. Sugimoto K, Nishi H, Miyazawa T, Fujita S, Okada M, Takemura T. A novel OCRL1 mutation in a patient with the mild phenotype of lowe syndrome. Tohoku J Exp Med. 2014. 232(3):163-6. [Medline]. Bökenkamp A, Ludwig M. The oculocerebrorenal syndrome of Lowe: an update. Pediatr Nephrol. 2016 Dec. 31 (12):2201-2212. [Medline]. Lewis RA, Nussbaum RL, Brewer ED. Lowe Syndrome. Pagon RA, Bird TD, Dolan CR, Stephens K, eds. SourceGene Reviews. Seattle: University of Washington; 2001. [Full Text]. Walton DS, Katsavounidou G, Lowe CU. Glaucoma with the oculocerebrorenal syndrome of Lowe. J Glaucoma. 2005 Jun. 14(3):181-5. [Medline]. Topaloglu R, Ludwig M, Çelebi Tayfur A. Selective proximal renal tubular involvement and dyslipidemia in two cousins with oculocerebrorenal syndrome of Lowe. Turk J Pediatr. 2013 May-Jun. 55(3):331-4. [Medline]. Nandedkar MA, Minus H, Nandedkar MA. Eruptive vellus hair cysts in a patient with Lowe syndrome. Pediatr Dermatol. 2004 Jan-Feb. 21 (1):54-7. [Medline]. Erdogan F, Ismailogullari S, Soyuer I, Ferahbas A, Poyrazoglu H. Different seizure types and skin lesions in oculocerebrorenal syndrome of Lowe. J Child Neurol. 2007 Apr. 22 (4):427-31. [Medline]. Won JH, Lee MJ, Park JS, Chung H, Kim JK, Shim JS. Multiple epidermal cysts in lowe syndrome. Ann Dermatol. 2010 Nov. 22 (4):444-6. [Medline]. Pirruccello M, De Camilli P. Inositol 5-phosphatases: insights from the Lowe syndrome protein OCRL. Trends Biochem Sci. 2012 Apr. 37(4):134-43. [Medline]. [Full Text]. Kühbacher A, Dambournet D, Echard A, Cossart P, Pizarro-Cerdá J. Phosphatidylinositol 5-phosphatase oculocerebrorenal syndrome of Lowe protein (OCRL) controls actin dynamics during early steps of Listeria monocytogenes infection. J Biol Chem. 2012 Apr 13. 287(16):13128-36. [Medline]. [Full Text]. Gahl WA, Bernardini I, Dalakas M, Rizzo WB, Harper GS, Hoeg JM, et al. Oral carnitine therapy in children with cystinosis and renal Fanconi syndrome. J Clin Invest. 1988 Feb. 81 (2):549-60. [Medline]. Allmendinger AM, Desai NS, Burke AT, Viswanadhan N, Prabhu S. Neuroimaging and renal ultrasound manifestations of Oculocerebrorenal syndrome of Lowe. J Radiol Case Rep. 2014 Oct 31. 8 (10):1-7. [Medline]. Mannino G, Abdolrahimzadeh B, Calafiore S, Anselmi G, Mannino C, Lambiase A. A review of the role of ultrasound biomicroscopy in glaucoma associated with rare diseases of the anterior segment. Clin Ophthalmol. 2016 Jul 29. 10:1453-9. [Medline]. Sener RN. Lowe syndrome: proton mr spectroscopy, and diffusion mr imaging. J Neuroradiol. 2004 Jun. 31 (3):238-40. [Medline]. Carvalho-Neto Ad, Ono SE, Cardoso Gde M, Santos ML, Celidonio I. Oculocerebrorenal syndrome of Lowe: magnetic resonance imaging findings in the first six years of life. Arq Neuropsiquiatr. 2009 Jun. 67 (2A):305-7. [Medline]. Attree O, Olivos IM, Okabe I, Bailey LC, Nelson DL, Lewis RA. The Lowe's oculocerebrorenal syndrome gene encodes a protein highly homologous to inositol polyphosphate-5-phosphatase. Nature. 1992 Jul 16. 358(6383):239-42. [Medline]. Kenworthy L, Charnas L. Evidence for a discrete behavioral phenotype in the oculocerebrorenal syndrome of Lowe. Am J Med Genet. 1995 Nov 20. 59(3):283-90. [Medline]. Kruger SJ, Wilson ME Jr, Hutchinson AK, Peterseim MM, Bartholomew LR, Saunders RA. Cataracts and glaucoma in patients with oculocerebrorenal syndrome. Arch Ophthalmol. 2003 Sep. 121(9):1234-7. [Medline]. Lavin CW, McKeown CA. The oculocerebrorenal syndrome of Lowe. Int Ophthalmol Clin. 1993 Spring. 33(2):179-91. [Medline]. Lin T, Lewis RA, Nussbaum RL. Molecular confirmation of carriers for Lowe syndrome. Ophthalmology. 1999 Jan. 106(1):119-22. [Medline]. Suchy SF, Nussbaum RL. The deficiency of PIP2 5-phosphatase in Lowe syndrome affects actin polymerization. Am J Hum Genet. 2002 Dec. 71(6):1420-7. [Medline]. [Full Text]. Tripathi RC, Cibis GW, Tripathi BJ. Pathogenesis of cataracts in patients with Lowe's syndrome. Ophthalmology. 1986 Aug. 93(8):1046-51. [Medline]. Hichri H, Rendu J, Monnier N, Coutton C, Dorseuil O, Poussou RV, et al. From Lowe syndrome to Dent disease: correlations between mutations of the OCRL1 gene and clinical and biochemical phenotypes. Hum Mutat. 2011 Apr. 32 (4):379-88. [Medline].